A Gloucestershire MP is worried his constituency will become a "dumping ground" for hundreds of new homes to be built in the north of the county. Conservative Laurence Robertson, the MP for Tewkesbury, said the Joint Core Strategy (JCS) puts too many properties in his area. The draft plan, put together by three councils, covers housing needs in Gloucester, Cheltenham and Tewkesbury. It could see 28,000 new properties built over the next few decades. "I would have preferred Tewkesbury to have done its own plan, as indeed the Cotswolds has, Stroud has and the Forest of Dean has," said Mr Robertson. "I think there's been some progress made with regards to estimating the number of houses which are needed. 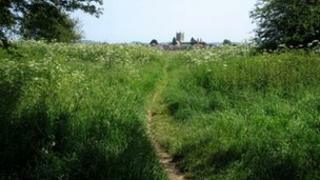 "But it would be unfair for Tewkesbury to take the lion's share. "We've got restrictions such as flood planes, flood risk areas, Areas of Outstanding Natural Beauty, such as green belts." He said he wanted to see a "sensible plan" put in place, and a "sensible calculation" of how many houses Tewkesbury would need. The preferred option document is due to be released in June 2013. Following consultation, the government will make its final decision in July 2014, with the plan due to be adopted in August 2014. Andrew North, from the JCS, previously said the plans were "the most important and far-reaching consultations we have carried out over many years".